Hey there and good morning! 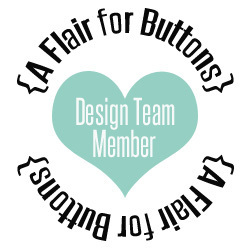 I'm on the Paper Issues blog again today sharing this project featuring our FREE cut files. 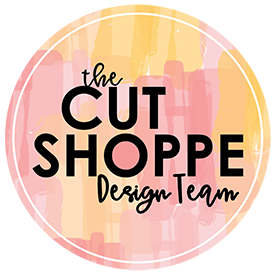 You know, there are so many great cut files in the shop! Sometimes I'm overwhelmed and have no idea where to start. Other times, like today, I have an idea in my head and can't wait to get started. Oh, so that idea? Well, leaves. Layered leaves. I mean it's fall after all right? 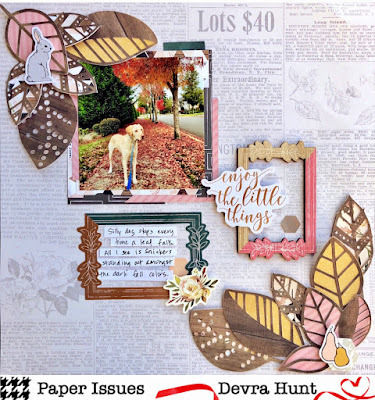 So I cut a bunch of leaves from the November Tags, October Daily Tags, Collecting Leaves and Fall is My Favorite cut files using Pink Paislee Auburn Lane. Yeah, now the fun part. What to do with them! After moving them around the Newsprint page for a while, they landed in the corners. I like them there. They frame the photo nicely. But then I had space to fill. I don't like a lot of wasted space. So I filled it with a wood frame and some ephemera. Voila! 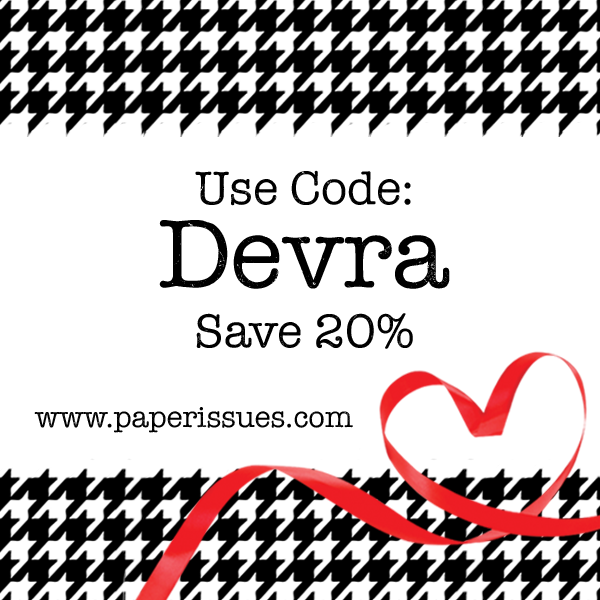 This is a simple page really but these cut files make it special. Thanks so much for stopping by my creative view today. Ive got a few things up my sleeve before the end of the month so come back again soon. 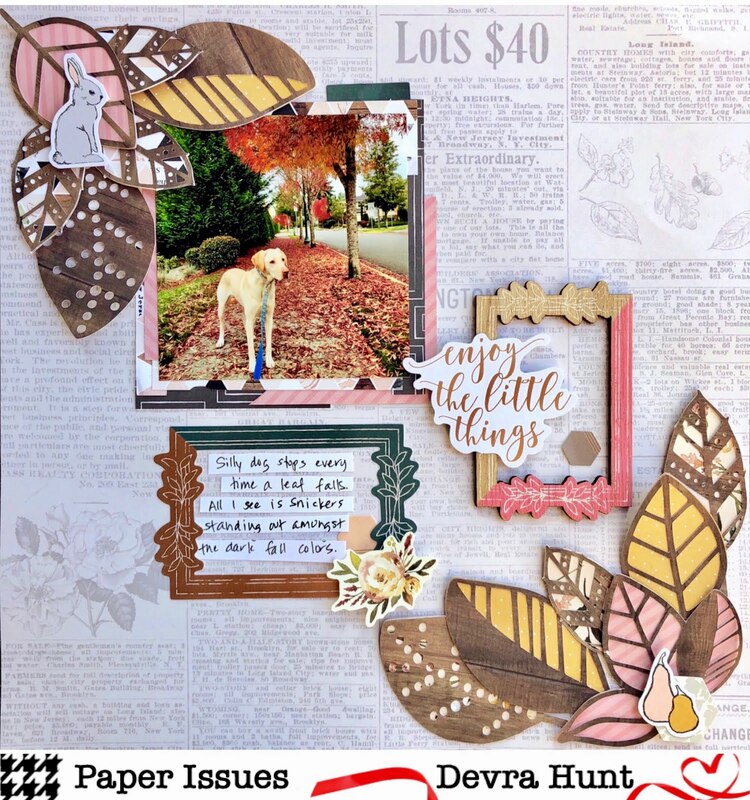 you can get Auburn Lane and many other things in the Paper Issues shop. Use DEVRA at checkout for 20% off your purchase.